Over the next few days and weeks I will be releasing a series of basic 101 photography tips that I think are worth while sharing, inspirational, and hopefully make for better Photography. I am always thrilled to get feedback and comments or suggestions. Hope you enjoy the photo tips and find them helpful! Photo Tip #10 of 20: Add more spatial depth by including strong foreground objects in shots where the background is also important. 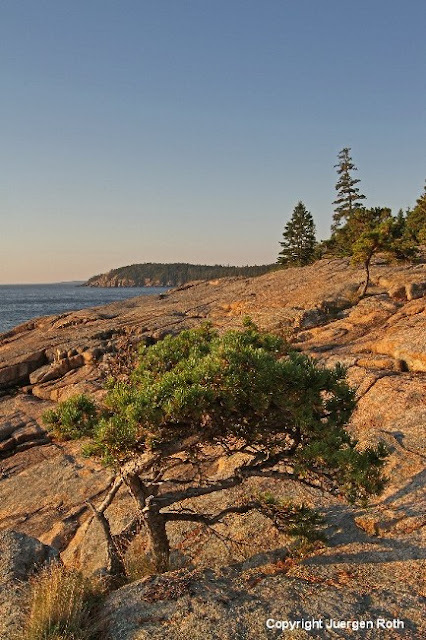 In this photograph of the Maine seacoast the tree made for a perfect foreground subject that conveys depth and perspective of the rigid seacoast. The beautiful morning light was still striking the Evergreen tree, granite rock formation and famous Otter Cliff in the far distance when I set up my camera and tripod for this last shot that morning … great day and memories. Go Patriots!